Hot sun. Blue waves. New romances. Old secrets. Gemma had her summer all planned out, but it takes a sharp turn when she gets dumped and finds herself back in the Hamptons after a five-year absence. Gemma intends on making amends, but a small case of mistaken identity causes the people she knew years ago—including Hallie and her dreamy brother, Josh—to believe she's someone else. As though the summer wasn't complicated enough already. Filled with summer sun, boys, and friendships gone sour, Katie Finn's first novel in the Broken Hearts and Revenge series sizzles and delights. Tomorrow is another day. Things will look brighter in the morning. It's always darkest before the dawn. But just before I drifted off, another, far less comforting saying flashed into my mind. I turned the volume on the TV down slightly and lay down again, holding on tight to what Josh had just said. That it didn't really matter what you called yourself. So maybe when he found out the truth, he'd understand that some deception was necessary for a larger purpose. Sophie and I walked the beach together, and I was silent at first, trying to gather my thoughts, rearrange all the pieces of a story I'd never had to tell to anyone before - a story I'd never even admit out load - into some kind of order. And even though Sophie could be the most impatient person on Earth (I'd once seen her curse out her phone when a page wasn't loading fast enough), I didn't feel any of that from her now. I knew, somehow, that she'd walk with me for as long as it took to be able to tell her. Truth be told, the synopsis of this book made me a little iffy. I have a hard time getting behind books where someone fakes their identity and lies to try to make up for a past transgression. I mean, it what universe does this scenario work out for all parties. (Spoiler alert: No universe.) But when I found out that Katie Finn is a pen name for Morgan Matson, I found myself willing to give Broken Hearts, Fences, and Other Things to Mend a chance. Best decision! After returning to the Hamptons to stay with her father over the summer, Gemma finds herself face-to-face with a terrible act she committed as an eleven-year-old and a strong desire to make amends to those she wronged. However, instead of saying "Hey, can we talk about how I was an awful kid five years ago?" she jumps on the mistaken identity opportunity and runs with it. While I liked Gemma as a whole, this is such a major flaw in this character. She re-friends Hallie and Josh under her new identity in an attempt to show them that she's not a horrible person. She was eleven and she made a huge mistake - something she regrets - and she just wants to make things okay again. How she thinks lying about it is going to help, I don't know. But it did make for a good story! The romance with Josh is cute and innocent - with the exception of Gemma's boldfaced lie. I like Josh; he comes across very genuine and cares for Gemma and I feel bad for him. This is another instance where I wanted to shake Gemma and say "This is going to blow up in your face!" I would have liked to see more of Sophie, Gemma's best friend. Gemma kind of blows her off a bit while dealing with the whole Hamptons thing and while she does make more of an appearance in the end, I'm hoping to see more of her in the subsequent books. 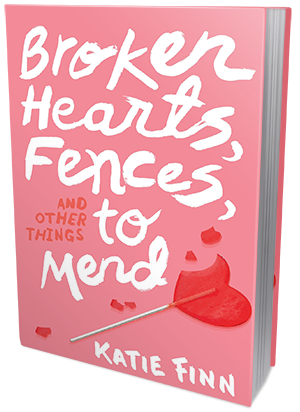 Overall, Broken Hearts, Fences, and Other Things to Mend is a fun and quick read. The ending is a rather nice cliffhanger and I'm so grateful that I have the sequel on hand to start right away. This lady really knows how to leave her readers hanging!